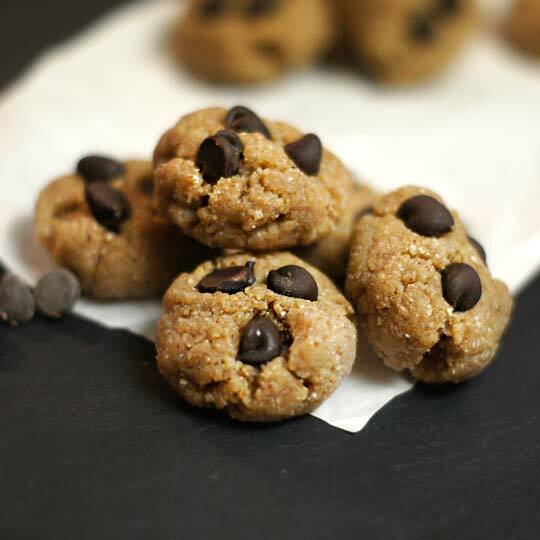 These bite-sized treats feature coconut oil, almond butter and pure maple syrup, which when combined with dried almond pulp, create the texture and mouth feel of traditional cookie dough–> without any raw eggs to worry about! As I’ve mentioned before, coconut oil, along with other healthy fats, are key to brain health and may actually boost metabolic function. Almonds not only contain additional healthy fat, but are also associated with lowering cholesterol and are a hefty source of magnesium and vitamin E. With an extra boost of fiber from the almond pulp, this naturally sweetened cookie dough is actually something you can feel good about eating! The key to working with almond pulp is drying it first, so don’t be tempted to skip this crucial step. Trust me, I’ve tried! I use my dehydrator to dry my pulp overnight, but you could also use your oven to speed up the process. (They won’t technically be “raw” anymore, but using at temperature of 250F will dry the pulp out in an hour or so.) 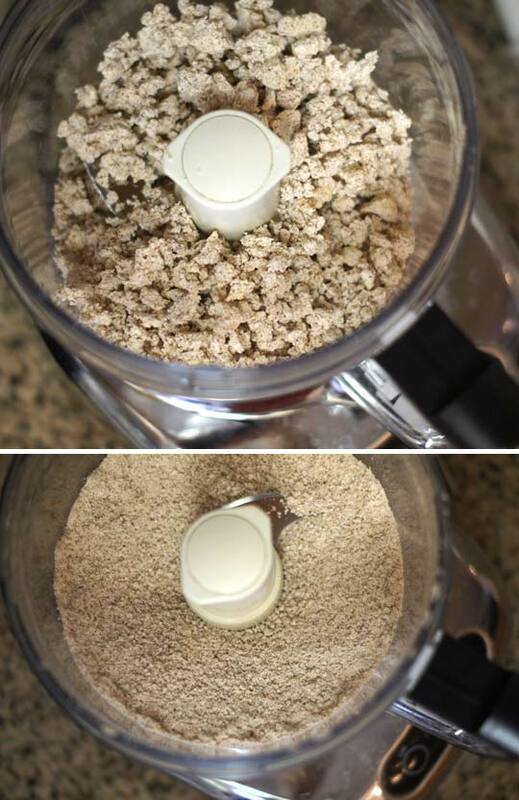 Once the pulp is dry, you simply pulse it in a food processor to break up any clumps and create a flour-like texture. Any leftover almond pulp “flour” can be stored as you would traditional almond flour, in a sealed container in the pantry, or in the fridge for longer shelf life. Measure out one cup of the almond pulp flour, using the “scoop and swipe” method: Scoop the flour with a measuring cup and swipe the top with the back of a knife to level off the top. Combine the dried almond pulp flour with the coconut oil, almond butter, maple syrup, vanilla and sea salt in the bowl of a food processor, and pulse until a sticky, uniform batter is formed. Adjust the flavor to taste, if necessary, then use a tablespoon to scoop the batter into bite-sized balls. The batter may feel slightly greasy, thanks to the coconut oil melting with the warmth of the food processor, but rest assured that they will lose that greasy texture once they have set in the fridge. Roll the batter between your hands to form a smooth shape, then arrange on a baking sheet lined with parchment paper. Press the dark chocolate chips into each ball, before placing in the fridge or freezer to set. I placed mine in the freezer, because I’m impatient, and I found that these were set “enough” after 10 minutes. I actually recommend storing and serving these bites directly the freezer for best texture! Note: As an added bonus, these little bite-sized bites can also be baked for a delicious cookie treat! They don’t spread like a traditional cookie, but they do get crispy on the outside and stay soft and tender on the inside. If you keep a stash of these bites in your freezer, you will only be 10 minutes away from a freshly baked chocolate chip cookie anytime you like! To bake, preheat your oven to 350F and arrange the frozen cookie dough bites on a baking sheet lined with parchment paper. Bake for 8-10 minutes, until the cookie bottoms are golden brown. Allow to cool for 5 minutes– they will firm up a bit– then devour! 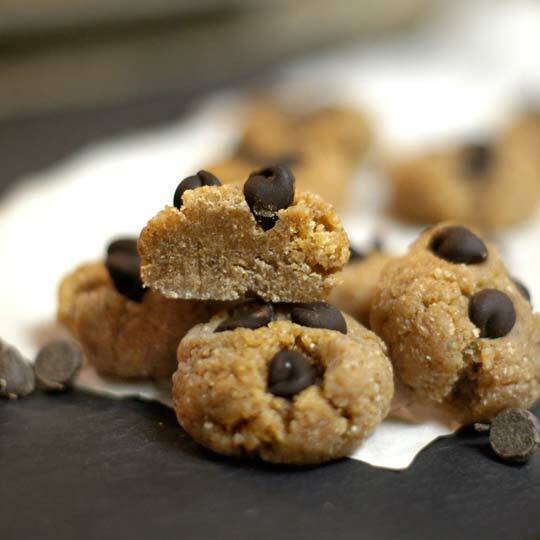 These bite-sized treats feature coconut oil, almond butter and pure maple syrup, which when combined with dried almond pulp, create the texture and mouth feel of traditional cookie dough--> without any raw eggs to worry about! The key to working with almond pulp is drying it first, so don't be tempted to skip this crucial step. Trust me, I've tried! 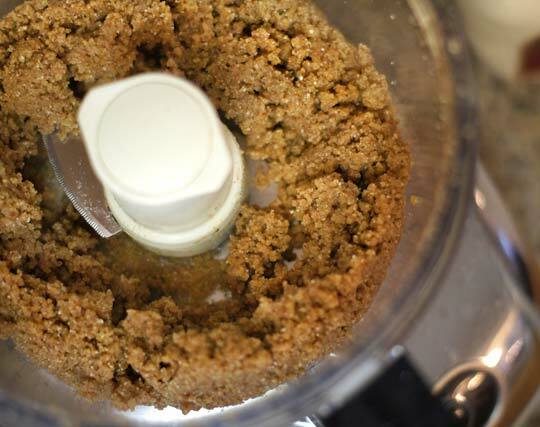 Once the pulp is dry, you simply pulse it in a food processor to break up any clumps and create a flour-like texture. Any leftover almond pulp "flour" can be stored as you would traditional almond flour, in a sealed container in the pantry, or in the fridge for longer shelf life. Measure out one cup of the almond pulp flour, using the "scoop and swipe" method: Scoop the flour with a measuring cup and swipe the top with the back of a knife to level off the top. I placed mine in the freezer, because I'm impatient, and I found that these were set "enough" after 10 minutes. I actually recommend storing and serving these bites directly the freezer for best texture! As an added bonus, these little bite-sized bites can also be baked for a delicious cookie treat! They don't spread like a traditional cookie, but they do get crispy on the outside and stay soft and tender on the inside. If you keep a stash of these bites in your freezer, you will only be 10 minutes away from a freshly baked chocolate chip cookie anytime you like! To bake, preheat your oven to 350F and arrange the frozen cookie dough bites on a baking sheet lined with parchment paper. Bake for 8-10 minutes, until the cookie bottoms are golden brown. Allow to cool for 5 minutes-- they will firm up a bit-- then devour! Reader Feedback: Have you tried any other successful almond pulp recipes? If so, please share! I love these cookie dough cookies. I freeze the cookies for a treat but I also bring them to my triathlon trainings as a “goo” to help give me the needed energy to complete my workouts (my diet forbids processed sugar, flour, etc. so I can’t have any of the goo’s or other energy snacks that other athletes carry with them). I put less coconut oil in mine as they came out a little oily the first time I made them. I’ve also been adding all sorts of other yummy healthy stuff to my dough (maca powder, hemp protein, and I make my milks from almond, walnut and hemp hearts so the flour I use is a little different). My husband begged me to put cinnamon in my last batch (he loves cinnamon and its many nutritional benefits) and they tasted great. Thanks so much for this awesome recipe. I’ve tagged it on my site as other Crohn’s and Colitis sufferers have been asking about the “goo” recipe I’ve been using for my workouts. I tried this recipe. I had 3 cups of dried ground almond flour, so I tripled the recipe. It was swimming in oil. I don’t think the coconut oil was necessary. The ground raw almond butter had plenty of oil in it. I’d probably not use maple syrup again. I think brown sugar or palm sugar would work better. The dough is pretty much impossible to mix. The food processor didn’t work. The bread dough hook on my mixer didn’t work. Finally dumped it into a bowl and used a potato masher to try and mix it. This recipe needs more work. Did you use the pulp left after you make almond milk or did you use the ground almond flour? This recipe calls for the dried pulp not for the ground almond flour. Sounds to me that you used ground almond flour… That would explain why it was so oily. The pulp left after you’ve made almond milk is totally defatted, since all the fat was squeezed in the almond milk. I mixed everything together. Kept them in the fridge for some time, and they were hard. Put them in the oven for 10 minutes, and they flattened out. They did not hold their shape. They flattened out more than traditional cookies. So much, I ended up having one big cookie. Any advice for the future? Wow these are great! Thanks for the tips on how to successfully make almond flour. I tried in my oven once and burned it, but it worked perfectly in my dehydrator. Great treat for that leftover almond pulp! I love them! MAde a couple of changes to the recipe though )because I did not have all the ingredients. First I completed the dried (in the oven 110 celsius for an hour + left in the turned off oven for the night) almond pulp with a little coconut flour, then, I substitute a mix of agave syrup and date syrup for the maple syrup. It tastes delicious!Definitely the kind of recipe I want to keep and share with my daughter. Thank you! Made these today and they are great! In fact, I consider it a miracle that my sugar loving hubby said he loved them. His “go to” snack is toll house cookie dough, so this is a huge step… thank you!!! Thank you for this recipe. I just made these and they turned out perfect. The best way to use almond pulp so far! I really like your blog, it is a great inspiration and source of information. Greetings from Finland! DELICIOUS! This is my new go to recipe for my left over almond pulp! Thank you!! This is awesome! So satisfying as a cookie dough alternative, even with cacao nibs. Thank you!! Wow! Just made a half batch… So good! Thanks for the recipe. Made these today with my leftover almond pulp and they are so delicious! Even my husband (who doesn’t like sweets) thinks they’re great. Made these last night and they are really good! They taste just like cookie dough! I like to use my almond meal with juice pulp in my raw breads and crackers. It works out well, I think, because I like to put flax in my milk for a thicker milk and because my blender isn’t the best so the flax doesn’t all get broken up. I made these this morning. They are really, really good. I just dried my pulp in the oven at 200 degrees for a couple of hours and it dried out. My 2 and 4 year olds like these too. Thanks for the great recipe. Please see my comments above if you’d like to use almond meal/flour instead of the almond pulp. We made these similar, but added oats and used the pulp still wet. I refrigerated it over night. Maybe used a bit more coconut oil. Worked really well. So yummy. My kids liked it just as well as regular cookie dough. When you say you make a big lot of almond milk each week, how much do you mean? And how long does it last without going off? I make 5 cups for myself, which lasts a week. Sometimes I have to make double that, if my husband is interested in almond milk that week, too. You are brilliant!!!!!!!! Thanks for taking the time to keep us all happy and answer all our questions and think of amazing recipes!!!!!!! This is my favorite food blog and believe me, I follow a TON of them!!!!!!!!! I made these last night! Perfect timing–they were delicious! I added some flax seed meal to make them even healthier. Yum!! Thank you!! How can you determine the nutrition fact of almond pulp? I presume it is different than almond flour. THanks! I’m a fan of anything cookie dough related, and this looks like a perfect healthy alternative to the regular butter and sugar laden cookie dough. I’ve been planning to make some almond milk, so I know where my almond pup will be going! These are so tasty, judging by what I licked off my spatula. 🙂 The batter is setting in my freezer right now. I make coconut/almond milk blend and I use the pulp in my daughter’s oatmeal, and to make chocolate cookies. Thank you for another delish recipe! Squeezing it is definitely not sufficient, it has to be very, very dry. If you have a dehydrator, I just spread the crumbled almond pulp onto a teflex sheet and crank the temperature to 120, leaving it there until I remember to check on it again! With the dehydrator, you don’t really have to worry about over-drying it, so you could let it dry overnight if you wanted to. Can you use almond meal instead of leftover pulp? I don’t make my own almond milk. But I am dying to try these. These look like the perfect treat to satisfy those sweet cravings in an undestructive way! 1 question…do I need a dehydrator to dry the almond pulp or do you just mean leave it out for a while? I do use a dehydrator, but you could probably leave it out in the sun for a few hours, if you don’t have any woodland creatures that would disturb it. 😉 Also, an oven set to low should work. After trying homemade almond milk for the first time just the other day, I’m a little obsessed with it (the almond milk “slushy” you posted recently is wonderful!) Looking forward to making these with all the leftover pulp I’m sure to have. One question: I have a tiny hand me down food processor that can only make very small batches of things, so I’m in the market for a new regular sized one but I’m also on a super tight budget. Do you have any that you recommend? These look fantastic! I’m always looking for new ways to use my leftover pulp so I’ll have to give these a try. Can you just use almond flour? or crushed up almonds? I’ve never made almond milk, plus I really want to try these tonight! Thanks. 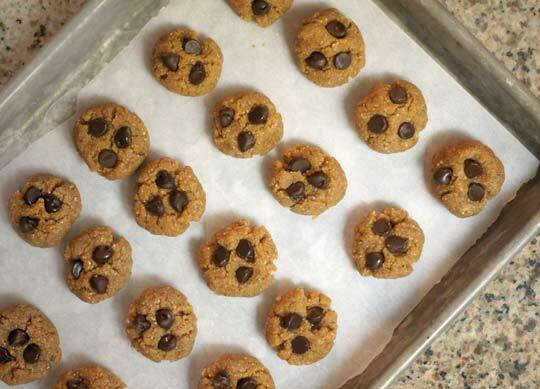 If you’re going to use almond flour or meal, I’d actually recommend using my recipe for Vegan Paleo Chocolate Chip Cookies instead: https://detoxinista.com/2012/06/paleo-chocolate-chip-cookies-vegan/ (Just don’t bake them for the cookie dough bites!) You don’t need all the extra ingredients that this recipe calls for, because you won’t need to cover up the weird almond pulp texture! Interesting that you talked about the texture – when I make almond flour, I grind the pulp in the dry grains container in the vitamix, so the texture is quite flour-like. Is your almond pulp coarser? Thanks for the idea, these look delicious! I’m referring to the fact that the texture is not as oily, since most of the fat has been removed in the milk-making process. That’s why I’ve compensated by adding extra fat to this recipe. If you were going to use regular almond flour or meal, you wouldn’t need to use as much coconut oil or almond butter to achieve the same texture. These are so delicious! I have made your classic recipe (https://detoxinista.com/2012/04/classic-chocolate-chip-cookies-grain-free/) with dehydrated almond pulp before and they come out great. Please tell us how to dry the pulp out! I have read where you can put it in the oven, which takes a LOT of hours. I don’t have a dehydrator, which would have been a choice. I do use my dehydrator, because I can turn it on and forget about it without worrying about burning. You can probably dry it in the oven on parchment paper at a low temperature– ideally between 200-300F– for an hour or so. Just make sure it doesn’t burn! I just tried this method for the first time yesterday and it worked great! I spread out my pulp on parchment paper and set the oven at 200*. I did check at the 30 and 45 min mark to make sure all was okay, it was fine and done after an hour. Also, I do have a question, how long does the almond pulp/flour keep? These look so yummy! I have recently started making my own almond milk and this will be the perfect way to use my almond pulp (after it’s dehydrated) of course!! It seems almost impossible to come up with a way to make the wet pulp taste good! It’s just too fluffy for my taste. I’ve mixed my leftover nut pulp (sometimes I use hazelnuts) into bread dough before. It adds a nice texture to the finished bread. And I am so excited to try these to satisfy my pregnancy sweet tooth! I will have to use honey instead of syrup; I live in Switzerland and the cost of maple syrup is prohibitive! Happily, the Swiss love honey. Hi Megan! When I make almond milk, I just strain it through a fine mesh strainer, which means that the “pulp” that I have left over is a little bit more wet. Can I still use this for your recipe, and how should I dry it out? Thanks! You should still be able to use it, I assume it will just take longer to dry. I use my dehydrator, but an oven set on a low setting for an hour or two should also work!